Technology has arrived at PT Ski with a brand new app for our guests’ benefit called Vamoos. With this gizmo everyone can have all their holiday information and documents all in one place on their phone or tablet, and there are some other bells and whistles too. There is a neat little countdown to the start the holiday and the photos in the “glance” itinerary feature are guaranteed to get guests excited about their trip long before they hit the slopes. What we are particularly excited about is the map as the information on many of the locations comes with a very particular PT Ski slant. There is a weather forecast and also opportunities to post photos and comments, making this the must have app for everyone on a PT Ski holiday. On the subject of apps, there are some other favourites which are well worth having on your phone. If you want to keep abreast of your ski stats then Ski Tracks is a particularly good one to get. This measures everything including your maximum speed, average speed, kilometres skied and vertical descent. You just turn it on at the beginning of the day and then show off your stats to your friends in the evening. You can also add photos so you can have a complete record of your day on the slopes. 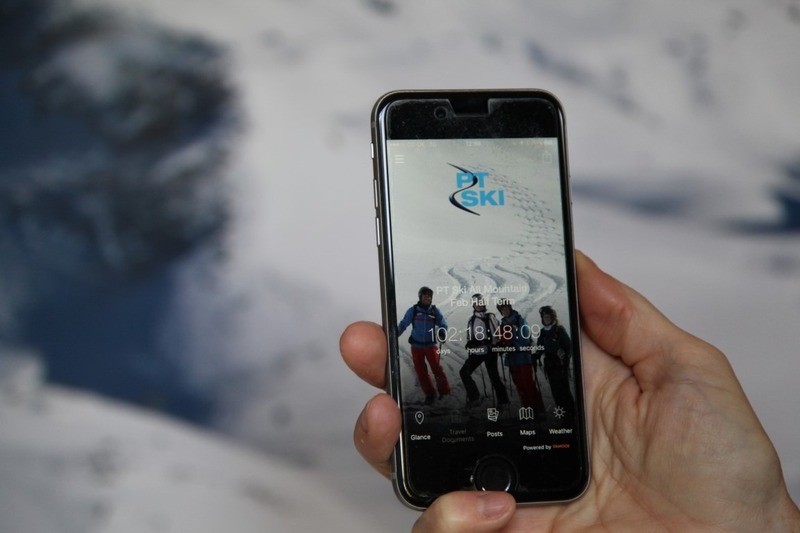 For those who like skiing off the piste then the White Risk app is an essential tool to have. Produced by the SLF, the Swiss Avalanche Institute, this gives daily avalanche bulletins across Switzerland including the risk factor and commentary on the snow pack. There is also other useful information about avalanches generally. This is an invaluable aid to help off piste skiers make better decisions about what slopes they should and should not ski. Snow conditions are the preoccupation of many skiers, particularly in the weeks leading up to a ski holiday. The Ski Club app has snow reports for pretty much every resort on the planet. For Swiss fans like us there is iSki Swiss which has weather forecasts, livecams and general resort information. It also tells you where all the Raiffeisen cash point machines are so you can guess who has sponsored the app! Of the same genre is Swiss Snow which also covers all the resorts in Switzerland and includes weather forecasts, piste maps and livecams. Last but by no means least is the Davos Klosters Mountains app! This has all the information you need for skiing in Klosters including what lifts and runs are open, livecams, weather, piste map, avalanche bulletin and even a tracker to monitor the stats of your day. The only thing it doesn’t do is wax your skis!